Justina had been diagnosed with a soft tissue sarcoma. The hitopath results are even better, final diagnosis is chondrosarcoma a rare type of cancer that is very slow growing and unlikely to metastasize. It was totally removed with good margins. Justina had leg amputation surgery on February 16, 2016. Histopath shows this will result in an excellent long term prognosis. Justina had surgery as the result of Bloat on February 19, 2016. TAGS is greytful for all of the thoughts, prayers and good wishes for Justina’s recovery and for all of the generous donations. If you would still like to make a donation please click on the “donate” button or mail a check to TAGS at P. O. Box 703782. Dallas, TX 75370-3782. Please think positive thoughts for Justina as she faces her healing and recovery process. TAGS and Justina thank you for your generosity and care! February 18, 2016 Update: Justina was very happy to see her foster mom and dad today and was glad she got to go home. 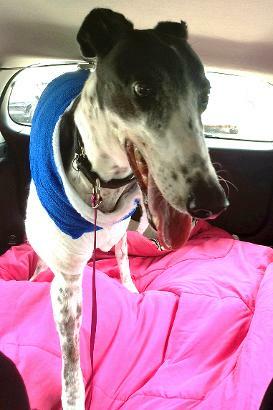 She also greeted everyone in the waiting room and everyone she met on the way out of the clinic. She was one happy girl. Justina walked out of the clinic leaving the cancer behind and is looking forward to a full and long life. She will have a few weeks recovery and we are hoping they are uneventful. Her next appointment is 02/29/2016. February 17, 2016 Update: At approximately noon today, the vet at the Surgery Center said Justina was doing OK. At that time she had not eaten. He said she seemed to be somewhat nervous. She was getting up and moving around some but she was heavily medicated. Another update this afternoon at 4:30 p.m. reflected positive progress. Justina is doing well. She ate today and went outside to potty. Hopefully she will have an uneventful night. February 16, 2016 Update: Per Dr. Lange the tumor was an odd shape but was isolated at the head of her triceps muscle. Justina would not have been able to use the leg if only the tumor were removed. At this point he still believes that this was a soft tissue sarcoma but we will not know for sure until we get the histopath results. Dr. Lange expects Justina to have a good postoperative outcome. March 25, 2016 Update: Thanks to all of you for your thoughts, prayers, good wishes and donations for Justina’s successful recovery. She is such a trooper and is now back to her “old self.” We will let you know if there is additional news. TAGS is still accepting tax deductible donations to help pay for the cost of two surgeries for Justina. Anything you can give is greytly appreciated. March 15, 2016 Update: Justina is doing great! She really has healed remarkably. She has learned how to position her front leg to support herself as needed. She is back to running in the back yard and playing with her foster siblings. She has also learned how to lean on her foster parents while looking up at them with her 'give me a treat eyes', and almost always talks them into one. She still rests a lot (don't most greyhounds) but is getting stronger everyday. She is good at telling you she is getting tired and will come in and rest. But still enjoys Friday night movie night with her foster parent's grandkids! Justina is one special grey! February 29, 2016 Update: Today was a greyt day for a greyt girl!!!!! Dr. Douglas Lange and Dr. Zachary Wright reviewed Justina’s histopath results and agreed that the chondrosarcoma tumor was removed successfully by the amputation of her left foreleg. There is no evidence of metastasis, and there is a strong likelihood for a cure and a long life. They agreed this is a rare tumor in dogs. Justina’s shoulder sutures and her stomach sutures and bandages were removed today. She is moving around on three legs like a champ. Her pain meds will be reduced and she has one more week of leash walking and restricted activity. It’s now time for Justina to heal and get back to her normal life. She will have an X-ray in three months and further treatment options, if necessary, will be discussed at that time. TAGS and Justina thank all of you for your prayers and best wishes for Justina’s recovery. TAGS also appreciates your generosity, and all additional donations to help defer the extensive medical costs will be a greyt help. 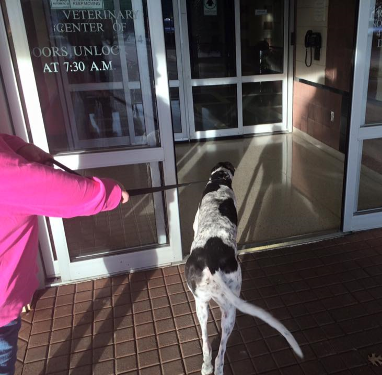 February 22, 2016 Update: Justina spent the weekend at the Veterinary Surgery Center. On Sunday they removed her from IV pain medication and said she was doing well. There was no heart arrhythmia, which was a possibility shortly after the surgery for bloat. Justina was released from the surgery center around noon today. She was very happy to see her foster family. She now has two incisions, but she seemed to feel better today than she did when she was picked up last Thursday after the amputation surgery. The vet said today she stood on her own with no help. She will be on a few new meds and special food to help ease her stomach back into full function but is expected to make a full recovery. Hopefully Justina will now really be on the road to recovery. It’s amazing how happy she acts after such an ordeal. TAGS appreciates any donation you can make to help with the costs of both of her surgeries. The cost has now doubled. This sweet girl thanks you too for both your prayers and donations. We will continue to keep you updated! February 20, 2016 Update: Poor Justina cannot seem to catch a break. She was doing well until early Friday morning. She started panting heavily and drinking lots of water and throwing up every time she took a drink. We contacted the Surgery Center and they were not too concerned but told us to keep an eye on her. The concern was bloat. By early afternoon Justina would not even eat fresh cooked chicken so we knew something was wrong. We called the Surgery Center again and told them the situation. Justina's foster parents took her in and an X-ray showed that her stomach was full of gas and slightly twisted. She had bloat! Justina was taken in immediately for emergency surgery to relieve the gas and un-twist her stomach. The report from Dr. Faludi this morning is that she is doing well – she is resting easy on the pain meds and has gotten up and gone potty. She will remain in the clinic's hospital for the weekend. Hopefully she can return to her foster home on Monday, February 22nd. Keep positive thoughts that Justina does not have any more setbacks. She has been through so much already. 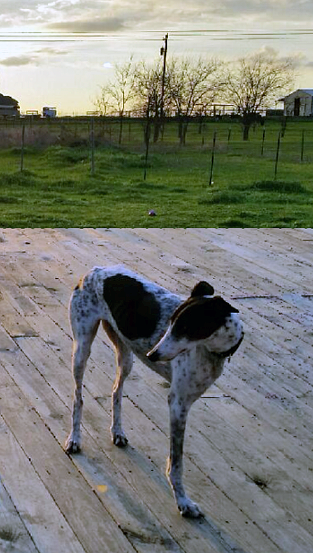 Some Greyhounds breeze through a life of retirement and other have more challenges. Justina is one that has had her share of challenges since coming to TAGS. Justina's first health issue was inflamed and severely infected. After several rounds of antibiotics, her teeth were cleaned and many teeth were removed. When her mouth did not return to “normal” Justina was examined by more than one vet who diagnosed her with an autoimmune disease that is affecting her mouth. She is being treated with Cyclesporine. It took a while for Justina to be adopted. 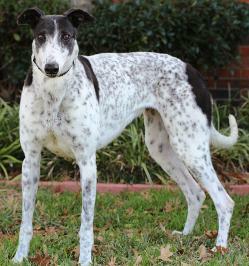 Unfortunately, it was not her forever home and she came back into the TAGS fold and back to her foster family. A few months ago, Justina began to limp. The vet was consulted and she started taking Rimadyl, which seemed to help. However, once the Rimadyl was discontinued she began to limp again. 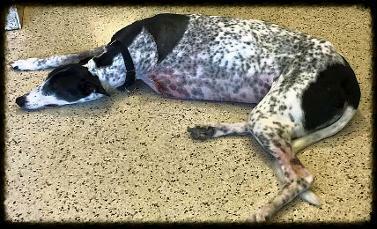 Her front leg was X-rayed and nothing unusual was noted so she began taking the Rimadyl again with the same result. After a month, she was X-rayed again and by that time a mass in the muscle under the top of her foreleg was visible and could be felt. The X-ray showed her bones to be clear. The TAGS’ vet referred Justina to Dr. Douglas N. Lange at the Dallas Veterinary Surgical Center. Dr. Lange reviewed her X-rays, blood work and did an examination and a needle biopsy. Dr. Lange then consulted with Dr. Zachary M. Wright, an oncologist at the Animal Diagnostic Clinic, and Justina was diagnosed with possible parosteal osteosarcoma, which is a malignant tumor next to the bone (as opposed to inside the bone) a soft tissue sarcoma. There is no way to ease into treatment – the only recommendation is amputation of the leg. After amputation, some chemotherapy may be advised. Justina is scheduled for surgery on February 16, 2016. The cost of Justina’s surgery and post-operative care is estimated to be between $3,000.00 and $4,000.00, without chemotherapy. TAGS is seeking donations for Justina’s surgery and after-care in an effort to give to Justina her best chance to have the happy and successful retirement she deserves. Throughout her ordeal, Justina remains her sweet, friendly self, always willing to give kisses to anyone who will let her. Your donations to TAGS, a 501( c)(3) nonprofit organization, are tax deductible. Please make your donation through Pay Pal online or send a check to TAGS at P. O. Box 703782, Dallas, Texas 75370-3782. 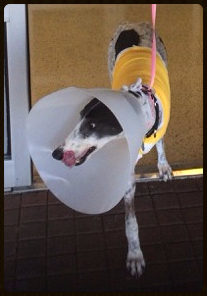 Your donations will certainly make the life of one special Greyhound better. 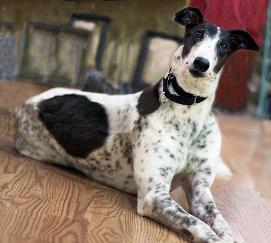 Justina will be delighted to reward your generosity with all of the kisses you can take. Click the 'Donate' link above to donate to help TAGS cover Justina's surgery and recovery. Please specify in the description that the donation if for Justina.